Autumn is a wonderful time of year to explore the outdoors. I love to take the children on long walks around the neighborhood. We find all kinds of leaves, acorns, seedpods, corn husks, feathers, and more. Nature has a plethora of goodies just laying around for the taking. I gave each child a bucket or bag to fill with their treasures as we walked. It always amazes me what the children find or deem valuable enough to keep. Their loot is carefully chosen and identified. I delight when a 3 year old can tell if a leaf came from an oak, maple, or cottonwood tree. It is remarkable how observant children are (if we let them be). This year, I took our nature walk to another level. We lugged home our brimming bags of twigs and leaves to create autumn wreaths for their parents. This let the children display their goodies and create a fun craft. The wreaths look amazing- I had the children make me three to hang in my dining room windows! I love this craft and was excited to see something similar featured in the Family Fun Magazine I received in the mail. They used colorful fall leaves for their backdrops and the colors really popped as they hung against the rustic barn. What a great use of nature's bounty! dried leaves, sticks, flowers, acorns, etc. Decide on the size of wreath you want to make. Choose a plate that is about that size and trace it on your sturdy cardboard. Take a smaller plate or lid and trace it in the middle of the large circle. Carefully, cut out the circles. This will create your wreath's base. Plug in the hot glue gun and chose the best corn husks. Glue your corn husks around the circumference of your base. Next, add different elements from your walk. Secure the leaves, sticks, seedpods, etc. firmly with the hot glue. Attach a ribbon or piece of yarn around the wreath so you can hang it. Display your wreath on the front door or in a window. Do you have any crafts that are perfect for the fall? These little monster cups are what we dished up for snack today. The boys and girls loved the creepy green pudding and the crunchy cookie topping. It was frighteningly good! I ran across these simple treats on pinterest or in a magazine. I can't recall the source of inspiration, but what a neat idea! The boys enjoyed this treat so much, that they were carted to Scout meetings and over to the neighbor's house. Make sure you assemble plenty of these pudding cups- the more the scarier! serve and dig up a bite! Do you have any fun and easy treats to make for Halloween? Friday, October 4th, was a dismal afternoon. The gray sky hung low promising rain that autumn evening. 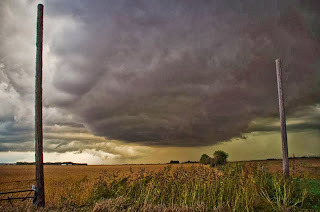 I was completely oblivious to the threat Mother Nature was stirring up just south of us. 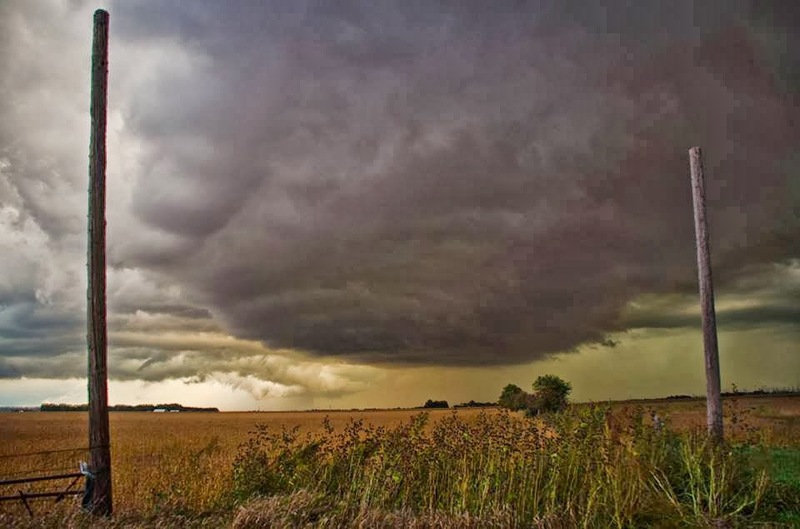 The above picture from Siouxland Severe Weather, taken by Aaron Siders, shows the clouds as they brewed behind a veil of rain. I paid a few bills online, scanned facebook for friends' and family updates on the snowstorm pelting the western part of Nebraska and South Dakota, and surfed a few opinionated online posts about the Government shutdown. I was waiting to pick up my oldest son from school and planned to head into Wayne to run errands. My younger boys and a couple neighbor children played with Lincoln Logs on the floor. A typical, ho-hum kind of afternoon. At least, it appeared that way. With little warning our world was turned upside down within minutes. A grandmother appeared at my door and informed me that a tornado warning was in effect for the area. A tornado was on the ground barreling towards us. She whisked her grandkids off and I raced the 6 miles to town to get my son who was waiting in the library. That was one of the longest (and fastest) trips to town that I can remember. I know that sounds strange, but my heart was pounding and I was concentrating on getting everyone home and nestled in the basement before the storm hit. The constant radio warnings and my cellphone buzzing "extreme weather alert" only heightened the urgency. Then the radio went off the air. I pulled into our drive three minutes before the storm was predicted to be on top of us. Splintered buildings, hurled John Deere implements, tossed airplanes, flattened homes, and cotton fabric flapped in stripped trees. That part of town was almost unidentifiable. The tornado leveled a good portion of the eastern side of town. 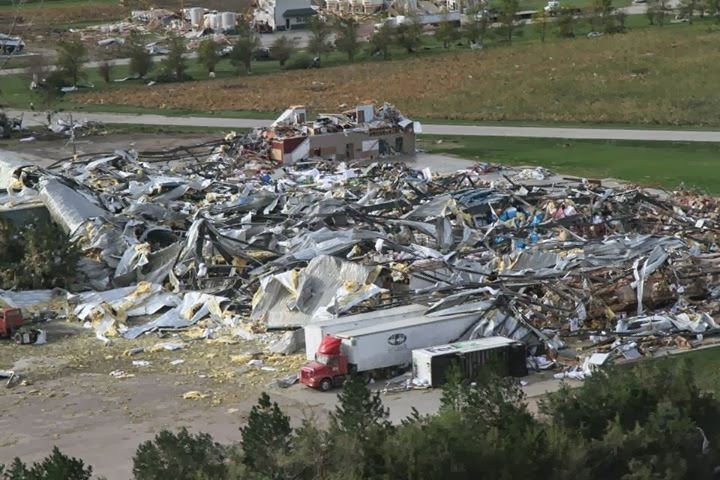 It left a mass of homes, farms, and businesses strewn across Northeast Nebraska. Luckily, no one died. People were injured and hundreds were left unemployed. The storm knocked most of the residents into a stunned state of being. However, Nebraskans don't stay down for long. Within minutes, the roads were filled with emergency crews racing to help. Volunteers flooded the town and clean up had begun. People rolled up their sleeves and united as these dark and lightening filled storm clouds rolled away to the northeast. It's amazing to see the camaraderie and support people from all walks of life have offered to the community. Old and young, rich and poor, Lutheran and Catholic, Republican and Democrat, all working together for one common goal. Shoulder to shoulder. People putting aside differences for the common good. It's been one week since the EF4 tornado hit Wayne. Businesses that were wiped out are already back to work in rented offices and machine sheds. Fundraisers are springing up to help those in need. Wayne is rebuilding and forging ahead with dedication and teamwork. Tonight, our thoughts and prayers are lifted for those in need- especially for the communities in South Dakota devastated by the blizzard, my neighbors and friends who were impacted by the tornadoes, and for the people suffering from the Government shutdown. Here is my wordless Wednesday post. We went fishing at Powder Creek over Mother's Day weekend and I took the opportunity to take a few pictures. I try to use an alphabet letter each week in my lessons with the younger children. As the end of the year approaches and summer beckons us outside with promises of sunshine, I need easy and low stress activities. This past week I crammed a quick "Yy" lesson in with the kids. I started the yarn for the children. I simply tied a knot around the base of the Y and showed them how to wrap. I let the children go and enjoy this activity. It is low stress and introduces the children to some fine motor movements that is great for coordination and developing skills. I tied the ends of the yarn as the children neared the end of their string. Do you have any fun activities for the letter "Yy"? It's finally Spring here in Nebraska! I am so thankful to see green grass and vegetation growing this year that I don't mind mowing or pulling weeds. My yard and the neighbor's yard, at least what is left of them, are in bloom. Full bloom! The children took the opportunity to pick as many yellow bursts as possible. I literally had bowls upon bowls of their sweet offerings lining my kitchen table. We won't even mention the loaded ice cream buckets they had waiting on the porch! I woke up yesterday to wails of disappointment escaping from my youngest son's room. It took me a minute to realize that I dropped the ball last night. Not a real ball, but I forgot to play the role of the "tooth fairy". I broke the parent and tooth fairy clause in the parent handbook. Last night, in a last ditch effort to redeem myself, I wrote up a small apology and added 4 extra quarters to his haul. This morning he was so excited! I think he enjoyed getting the letter more than the money. Have you ever botched a tooth fairy mission? What did you do? The school year is almost over and that means programs, fun days, and extra activities. My middle son and I had a lot of fun this evening preparing for "pioneer school". They are supposed to dress the part and bring an authentic lunch in a pail to school in the morning. The arrowhead necklace and blue heart are presents from my middle son. During his much anticipated class trip to Lincoln, he lovingly spent all of his souvenir money on me. Yes, me! Needless to say, I was a little bewildered when he offered up his heartfelt treasures the minute he bounced off the bus. His eyes were twinkling and he was so excited to give me something "real". Something that he purchased with his money. Something that Dad or his brothers didn't help choose. Something to surprise his mother with. I was expecting him to collect odds and ends, little cheap trinkets from all the tourist shops they wandered through. I thought he would buy chewing gum and magnets. Not sentimental items for me. A perfectly fine response. Then I HAD to open my big mouth. Looking back, I regret my response and wish I handled it better. "I gave you money to buy things for yourself, not me," I lectured. Luckily, it was dark in the van and I couldn't see the disappointment darken his hazel eyes. I hadn't considered how terrible my response was until my husband pointed out a startling concept. As much as I hate to admit it, he was right. "Why can't we do nice things for you? You always go out of your way to make our days special and he wanted to do something for you. Just let it go and let the boy treat you the way you treat us." Allow the husband and children to lather their love on you. If they pick dandelions or buy you a bouquet of roses- let them. If they bring you breakfast in bed- eat it. I could go on and on, but I know you get the gist of what I am saying. Allow them the joy of helping. Let them show their appreciation and develop empathy for others. As mothers, we are accustomed to putting everyone else first or their needs ahead of ours. Some of us have had years of practicing this martyrdom and it's become second nature. We may not even recognize it! We give the children our dessert or we scrimp pennies so they can go to summer camp. Isn't that what mother's are supposed to do? Don't get me wrong, I am not saying we need to become the alpha mother and expect everything to be served to us on fine china. However, we can take these moments and enjoy them. Give the experience of loving to your children. Let them own it and cherish their appreciation. For the past few weeks it's been foggy and dreary in this part of Nebraska. If it isn't snowing, it's cold and damp. I will gladly take the moisture, but it is May! I need to let a little sunshine in, if you know what I mean. So what is a girl supposed to do? Sit and wallow in the shadows? The weather may be dumpy, but I need to kick Spring into gear- even if it is only inside the house. I made a short list of frugal and easy ways I plan to brighten up my day. Pull back those drapes or blackout curtains and let the natural light filter in. Sunlight is important to our natural body rhythms, vitamin D levels, and frame of mind. Even if it is cloudy, opening the curtains allows you to glimpse outside. This is the simplest and easiest way to brighten your day! Housework? Yes, because those windows are dirtier than you think. The glisten a wiped window provides will instantly freshen up any dull day. It's cheap and takes little effort. Little finger prints and sloppy dog noses will quickly cover up the sheen in my house, but for the few minutes and little bit of vinegar, it was worth it. It's surprising how much grime collects on a plate of glass. 3. Make A Pitcher Of Lemonade or Raspberry Cordial. I chose to make a food that reminds me of summer so I whipped up a batch of bubbly lemonade. I haven't decided if it's the pucker of the sour juice, the vibrant color of the yellow rind, or the ginger ale that washes away the blues. This drink instantly puts a little pep in my step and a smile on my face. You can easily choose another drink or treat, but choose something that you associate with summer. Damp dirt is one of my favorite smells that I have yet to find a scented candle for. The aroma after a rainstorm or the musk of tilled soil is iconic with renewal. So if you are like me, with no garden to plant until the temperature rises, what are we supposed to do? There are several ideas on pinterest for small planters or you can start a few herbs indoors. I concocted an old pallet I found laying in our basement into a planter for our lettuce and spinach. I even transplanted some thyme and rosemary for in the kitchen. This probably is my craziest way to brighten the day, but the feel of freshly shaved legs makes me think of Summer. After all that cleaning and planting you will want to take a shower or soak in a hot bath. If it's warm enough, you can even wear capri's or shorts! Lather up and wash that dreary day down the drain. What tips do you have to brighten up a rainy or bleak day? I am the first to admit that I falter when it comes to consistent, regular posting on the blog. Life gets in the way or the occassional television show, book, shopping trip, etc. See, I am great at making excuses. 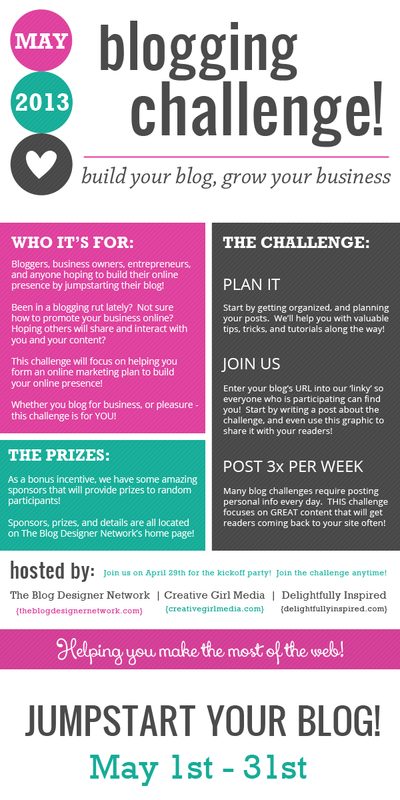 I decided to sign on for a blogging challenge for the month of May. Let's cross our fingers that I keep up with this, because it is a wonderful concept. Feel free to join up! It's almost strawberry season and I am starting to find great deals on the succulent fruit. I had several helpers this morning and we decided to concoct a couple of pies. I am a huge fan of this strawberry pie recipe- the filling is a cinch to put together and the chunks of fruit make this treat amazing. No complaints were heard from the children and almost everyone finished their piece. I cheated and used pre-made pie crusts from the store. Honestly, I could have rolled out my own, but our Spring schedules are so hectic that I cut a few corners when I can. The children were too busy licking the bowls that no one seemed to notice we skipped a step. This pie is easy and quick- we timed it at about 15 minutes of prep. Perfect for a busy day! Take advantage of the local produce or the sales at the supermarket and try this recipe. I think you will agree that it is definetly worth the hassle of a few dirty dishes. Clean and slice your strawberries. I prefer a thicker slice and the children really enjoy it. Set aside. In a saucepan, combine your water, sugar, and cornstarch. Bring to a boil. Add the strawberry gelatin and mix. Mix in the strawberries and pour into your baked pie crust. Refrigerate and let set up for a few hours. Top with cool whip or softened ice cream for a cool treat. What do you like to make with strawberries? On our morning walk we spied a couple of sparrows enjoying the sunlight streaming in an old carriage house. We heard them chirping and noticed them in this glass free window. We were lucky to have the camera along and snapped a few pics of the birds for prosperity. This carriage house is currently being torn down and salvaged, but it allowed us a nice view of the pair hidden inside. These are delicious! The chocolate hazelnut spread and warm flaky croissants melt together and create a tasty treat. They are made from two ingredients and you can pull them together fast. I saw these on Budget Savvy Diva's blog and just had to make them. Her recipe is a lot more detailed and exact. You might want to read her post for a better recipe. I just winged it. Use a spoon and spread Nutella on the triangles. Roll them like a traditional croissant. Bake according to their directions. Serve warm with a tall glass of milk.